Not only did my 5th/6th/7th writing class enjoy this activity, it was a great way to get them thinking about their main character before they started writing their short stories. 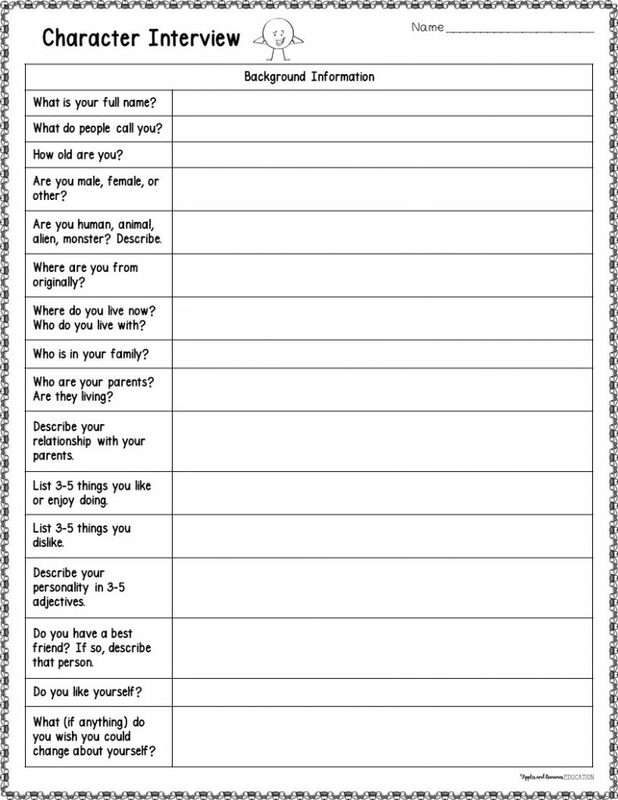 Character Interview and Character Brainstorming Sheets (you can come up with your own questions or get it here for $1). It’s helpful if your students know the basic plot elements (characters, setting, problem/conflict, rising and falling action, etc.) before doing this activity. 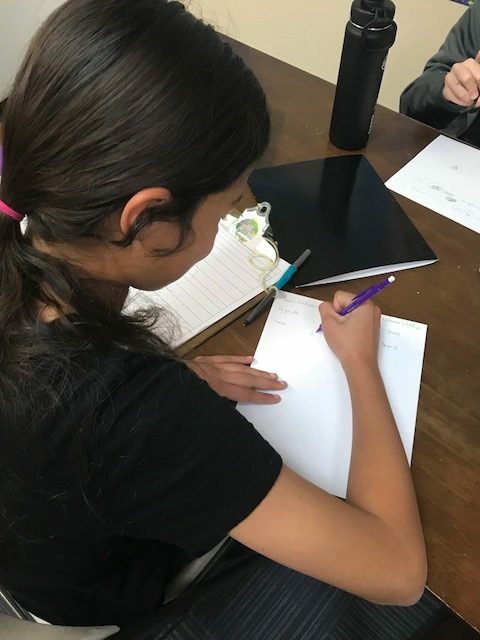 My students had already begun brainstorming a few possible short story plots before this lesson, so they already had a basic idea of a character they could write about. 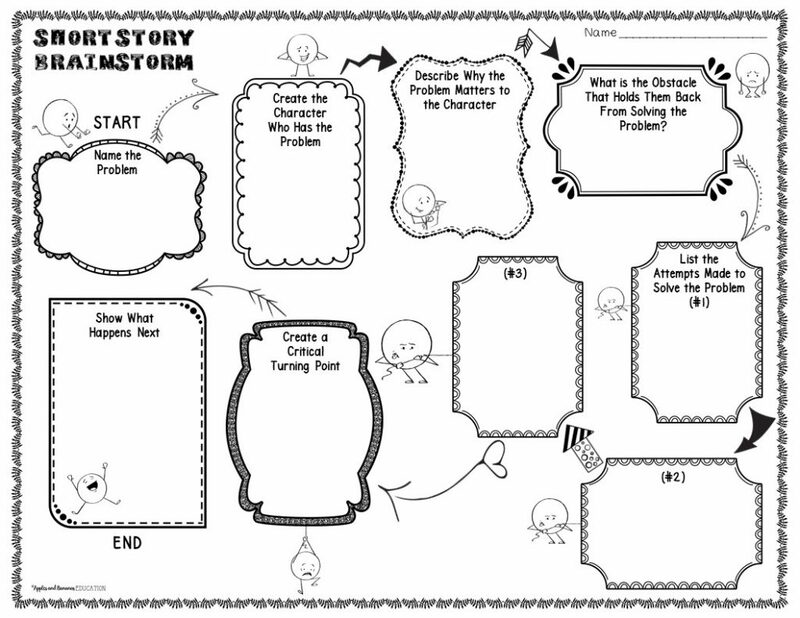 Here are some free graphic organizers I created that you can grab so that students have a general idea of their story plot. Tell your students that today they will be “getting into character.” Give your students a few minutes to draw/sketch their character and think about their character’s appearance, personality, experiences, etc. They can do this on the Character Brainstorm sheet included in the packet. Remind students that their character needs to fit the plot of their story. For example, if the character is a frail 80-year old grandma, her interests will probably be things like knitting, visiting her grandchildren, and scrapbooking, and NOT cliff diving, car racing, and carrying out spy missions (although that WOULD make for an interesting story…). The key is that students understand that their character needs to seem real and not random. If you have time to extend this into a multi-day lesson, you could start it out by having students choose a character from an actual book or story that the entire class has read. That way some of the questions (like the character’s name, appearance, and likes/dislikes) would be easily answered, and some of the other answers would be invented but would still need to fit appropriately. I only see my students one time per week, so we just went straight for the main lesson. After about 5-10 minutes of working on the sketching and brainstorming sheet, pass out the character interviews. I read all the questions aloud before having students interview each other, just in case they needed any clarification. 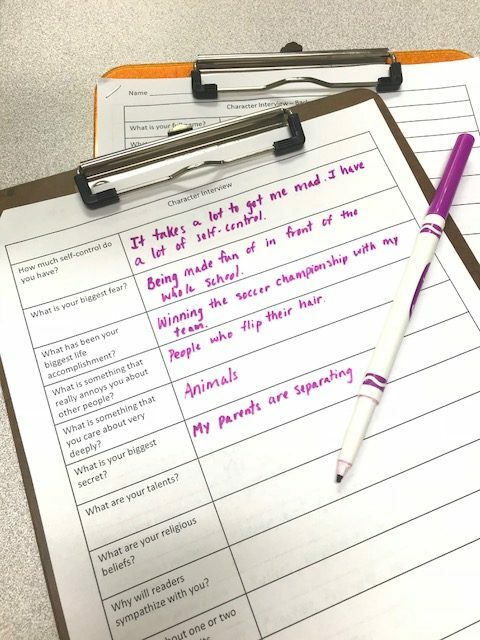 In my class, students asked their partners the questions and then recorded their partner’s answers on the interview sheet. Assure students that they will get switch papers at the end so that they can use them when writing their own short stories. Instead of having one person conduct the entire 3-page interview, I recommended that they switch after each page so that both partners get equal time. Depending on the length of your class, not all groups will finish, and that’s okay. The most important part of this activity is that it gets students thinking about their characters on a deeper level. 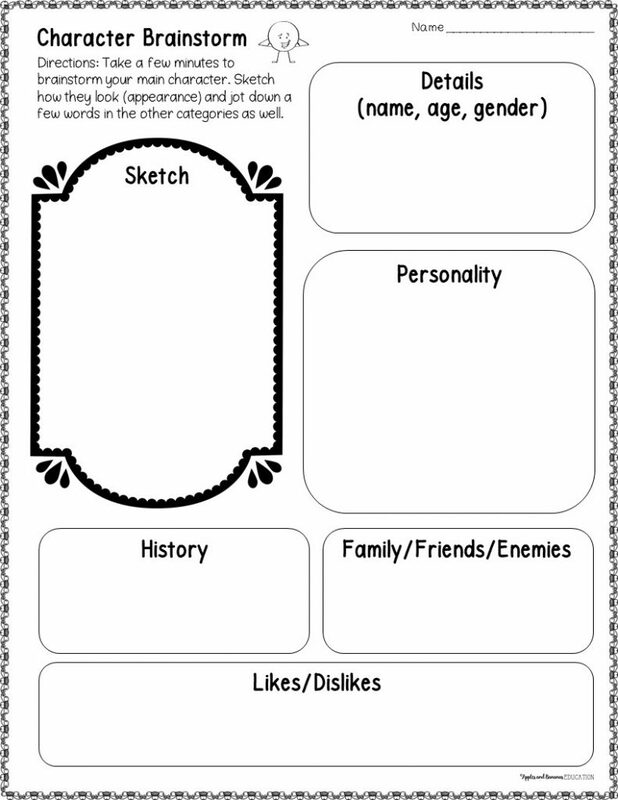 This will make the characters more real and believable when the student uses this information while writing their stories. Stop all groups with about 10 minutes to go in class. You can then choose a few groups to come up to the front and either have one partner introduce the other “character”, or have a character introduce themselves. They don’t need to read off every question and answer, but just give some of the highlights. My kids loved this part. We had one character who was a cocky, loner alien whose best friend was a cat. It seemed random at first, but as he continued to introduce himself we all got a sense of who this character was and could picture this character in the context of an entertaining, science fiction story. Another girl presented that she was a school bully, but once she explained how she came to be that way, we were really able to see the depth of her character. I loved having my students do this activity instead of jumping right into writing a story. It gives them direction and allows them to use their imagination, regardless of the type of story they are writing. Click here to sign up for our list. Receive monthly newsletters and access to our member-only Resource Library which includes the links to all of the documents mentioned in this post.